Model: The locomotive has a DCC/mfx digital decoder. It also has a miniature can motor with a flywheel. 3 axles and a jackshaft powered. Traction tires. The locomotive has dual headlights front and rear that will work in conventional operation and can be controlled digitally. The headlights are maintenance-free warm white LEDs. 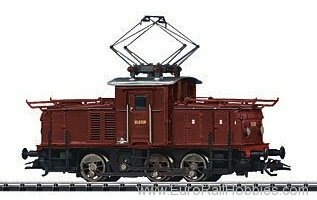 The locomotive has separately applied roof equipment. It also has separately applied metal grab irons. Brake hoses and prototypical couplers can be installed on the buffer beam. Length over the buffers 11.2 cm / 4-7/16".